This Truffle Cake Roll is a death by chocolate cake with a ganache filling! 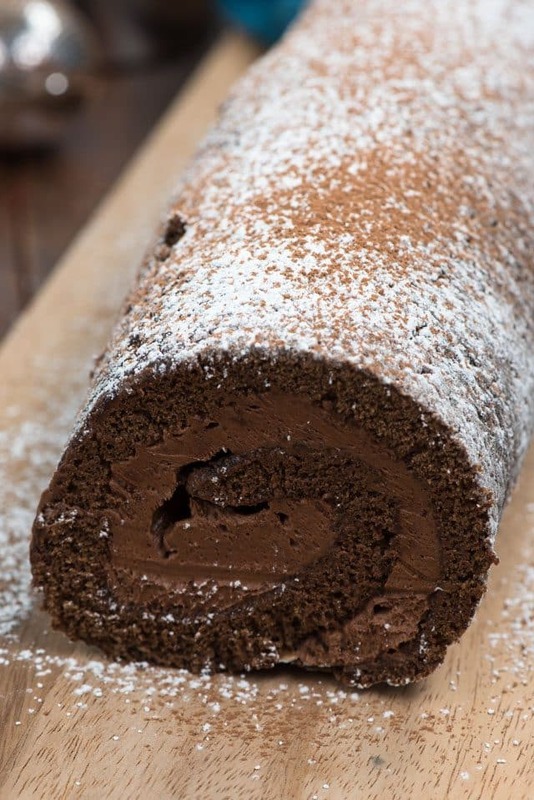 It’s the perfect cake roll recipe for chocolate lovers. Don’t be afraid of the cake roll! This Chocolate Truffle Cake Roll is one of my favorites yet – a rich chocolate truffle filling inside a from-scratch chocolate cake roll! Cake rolls are amazing. There are so many flavor combinations! It’s my goal in life to turn everything into a cake roll at some point…because I can. So far I’ve made Carrot Cake, Turtle, Zucchini, Caramel Apple, and Vanilla. Now? Now I’m doing chocolate! Okay, so let’s just address your cake roll fears. They’re not scary, I promise. I used to be scared of them, until I made one. Then I realized it’s more about practice and technique. And you know what they say: practice makes perfect. So I plan to keep on practicing! If you are still afraid, make sure you’ve read my cake roll tutorial. There are pictures of each rolling step. And I also have rules for the perfect cake roll. Be sure to follow them. And watch me make them in a tutorial video. You can fill this cake roll with whatever flavors you want, but may I suggest truffles? Yes, I said truffle. This cake is filled with ganache! It’s so, so good. And rich. And chocolatey. You make a simple ganache with chocolate chips and heavy cream, and then once it chills, you beat it into a creamy chocolate ganache frosting. Then you spread it over the unrolled cake. Re-roll the cake and chill until the ganache sets a bit and you have a truffle filled cake! 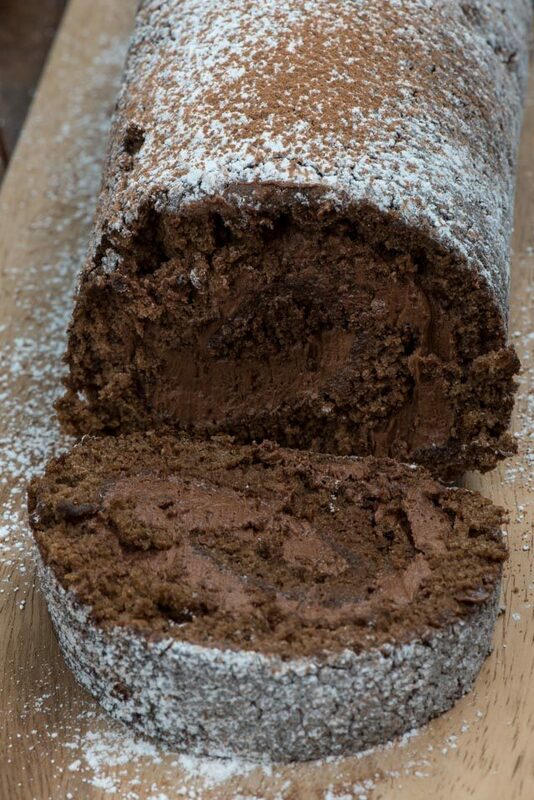 A Chocolate Truffle Cake Roll is perfect for chocolate lovers – I also call this a death by chocolate cake roll! 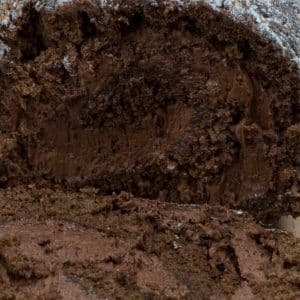 Can you make a chocolate cake roll with cake mix? Yes you can, but it’s not as easy as just making a cake. Use my Turtle Cake Roll recipe as a guide – one cake mix will make TWO cake rolls. What happens if my cake roll cracks? Even for a seasoned cake roll maker cracks will happen. Unless it completely falls apart, it’s definitely salvageable. If it cracks along the sides, just use more filling to glue it together. If it cracks along the top or somewhere where it really shows, whip up some extra filling or whipped cream and frost the cake like this one. Why does a cake roll crack? That’s a loaded question, because I’ve made this same cake recipe hundreds of times with success and then one time…it cracks. I often joke that it’ll crack if it’s over cooked or under cooked or if it’s Tuesday…because you never really know. But not too over done. An overdone cake roll will also crack because it’s too dry. Also, ew. Texture – I talk a lot in all my cake roll posts that beating the eggs is essential. You cannot skimp on beating the eggs. Do a full 5 minutes if you’re using a hand mixer, 3 if you’re using an electric stand mixer. The volume of the eggs directly affects the moistness and sponginess of the cake, which will also affect how much it cracks. Can you use parchment paper for rolling your cake roll? I’ve always used a powdered sugar towel, but I did use parchment paper for my pumpkin cake roll, just to try it out. I’d gotten a suggestion from a reader and wanted to see. It does work but I find that the old fashioned way (a powdered sugar towel) works best. Be sure to watch the video in the recipe card. Check out this tutorial video on making cake rolls. See a step-by-step photo tutorial for making cake rolls. Check out all my rules for cake roll making. Check out all of my cake roll recipes here. See some of my friends favorite cake rolls! This Truffle Cake Roll is a death by chocolate cake with a ganache filling! 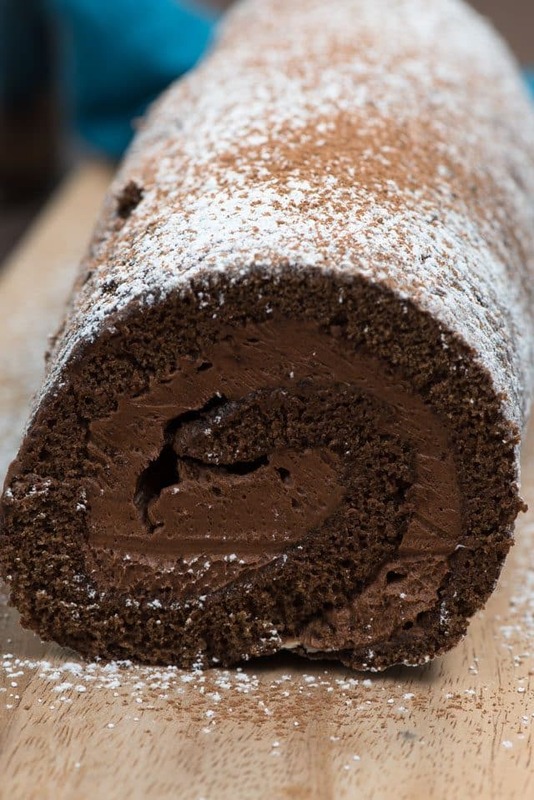 It's the perfect cake roll recipe for chocolate lovers. Beat eggs at high speed for 5 minutes, until frothy and dark yellow. Beat in sugar, water or coffee and vanilla extract. Whisk together salt, baking powder, cocoa and flour. Stir into wet ingredients just until blended. Spread in prepared pan. Batter will be in a very thin layer and you will need to use a wooden spoon or spatula to spread it to all the corners of the pan. Bake for 9-15 minutes or until it springs back when poked. While the cake is cooling, place heavy cream and chocolate chips in a microwave safe bowl or measuring cup. Heat for about 45 seconds, then whisk until smooth. If the chocolate doesn’t want to melt, you can heat in additional 15 second increments until it will. Chill until the mixture is thick about 15-30 minutes. Once it's thick and chilled, beat it with a hand mixer until lighter in color and fluffier. When you want to assemble the cake, unroll the roll carefully. Spread the frosting evenly over the top.Re-roll your cake, wrap tightly in plastic wrap and chill for about an hour before serving. Dust with powdered sugar and cocoa before slicing and serving. 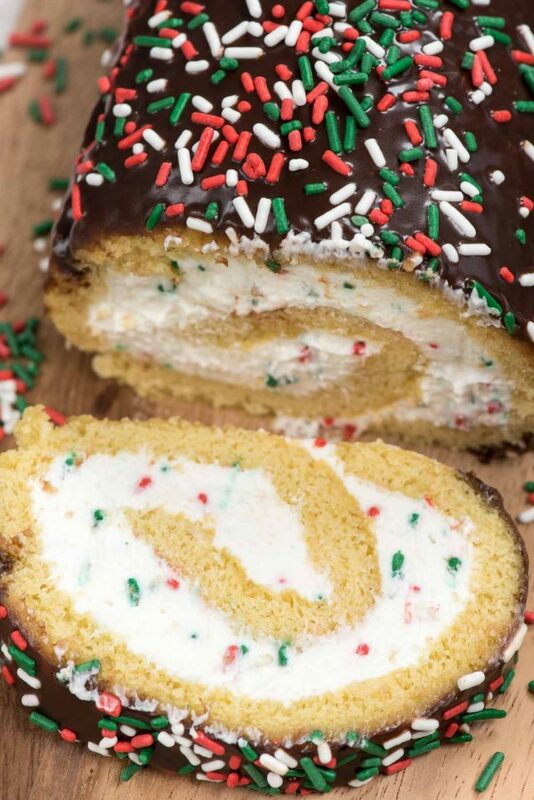 Christmas Cake Roll is perfect for the holidays. 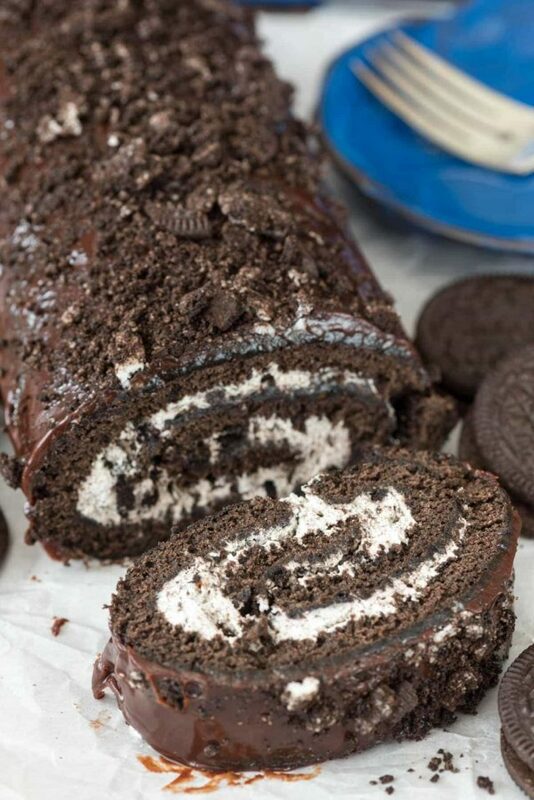 Oreo Cake Roll has a creamy filling! 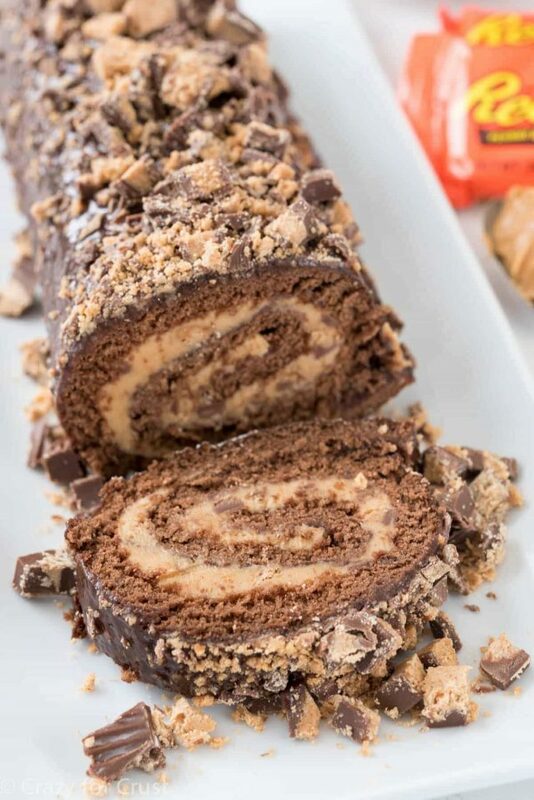 Peanut Butter Cup Cake Roll tastes like Reese’s! This post was originally written in 2014. Photos, content, and video updated/added 2018. 50 pies! That’s amazing. I totally agree about the negativity on social media, I stopped participating. My skill is caps, knitting and crocheting them. This year I topped 700 donated. At least people can have a warm head. Keep your chin up and ignore the haters. This cake looks wonderful. I’m trying it this week. Can you tell me for the filling, are the chocolate chips the semi-sweet or milk chocolate ones? This came together fairly easily, with just a tiny bit of cracking. I’m going to cover with chocolate buttercream and serve decorated as a Bouche de Noel. Recipe calls for coffee or water but it’s nowhere in instructions?